This is an interesting idea -- if you have any more thoughts here on how to make such an addition a better experience please mention it. Thanks! Pretty much the same with presets. This would help a lot and tons of speed for LR please. The ability of syncing between two machines would help too. would speed up the workflow too. Please consider this too and tons of speed for LR. Add folder support for swatches. As I have to work on multiple projects per day, I would be more efficient than having to load my exernal swatches files (ase). In fact, I could be a little like Illustrator or even better! For instance, importing a folder directly from kuler would be a great addition. There are several 3rd party applications that provide some of what I'm asking for, but it would be better if it could be done within Photoshop: abrView (PC only) can view brushes, but not organize; Brush Pilot can view brushes in folders, but not tag; abrMate (PC only) can view brushes; PresetViewerBreeze is the closest, since it lets you view brushes, patterns, shapes, styles, gradients, contours, swatches, and fonts, but not organize. The preset manager squishes the thumbnails into a square shape, so that some of the presets are hard to recognize. You can put presets into sets, but you have to load a whole set at one time, not one at a time. I would like to be able to view and add various tags to each preset that I have on my computer (not just the loaded ones), and then be able to view/search/sort by tag, such as Christmas, Grungy, Watercolor, etc. Each preset could have numerous tags, so it could be grouped differently based on the search criteria. For example, you could have a brush that had a Christmas theme, but was also grungy. You should be able to to find it under both tags. I would also like to be able to load each preset, not the whole set at one time. It is similar with the way of managing images in Bridge! Have the function of View/Search/Rate/Keywords/Group in presets will be great! When I saw the title, I immediately thought about Bridge! Yeah it is sad. A lot of useful things come from plugins to provide holes in Adobe's designs. No one knows that Bridge is the command center. Why would it be? It is not intuitive, slow, bloated and a real resource hog. Adobe made that decision–not the users. A previous topic on this was started a while back. See the link above. While there are organization tools via third party, hands down, other applications are ahead on this--including Corel, Painter, Manga Studio EX, and also type applications. I'd also like font management to come native to it. Details are in the link and there is a fair amount of support for the idea. Also, as mentioned in that thread, I'm pressing for being able to give the brush author credit in a meta-type set up, but optional... and also searchable. Be great to have this across the board in all applications, not just Photoshop. Agreed. Painter, Sketchbook Pro and Manga studio have some great functionality, and have had for years. Like mirror/tile painting, real time brush rotation, stroke smoothing, ability to draw along specific angles are huge time- savers. Yet, Adobe tries to shove more lame features like 3D and Video into Photoshop...? I love your comment. "for those who do things professionally..." yes. Listen to the professionals. Please try to understand that Photoshop serves many professionals in many different areas. Video professionals and 3D professionals also have different needs and requests (including many we have implemented). Look at the brush organization in Painter. Not saying Photoshop should do that, but considering that painter has a brush history, and enhancements for sizing, color, etc, some of that might be useful for photoshop users. It would also be nice to be able to sort presets (such as swatches and styles) in the swatches and styles panel, without using the preset manager. It would be easier to organize them faster by dragging them inside the panel. It would be great to have folders or groups for patterns in Photoshop. It get's messy when you have a large number. Folders for patterns in Photoshop. Suggestion: Associate color swatch groups with a file or provide controls for showing / hiding multiple swatch groups in the Swatches panel. I typically deal with over 5 projects a day which all have different color requirements and it would be a great time-saver to be able to select a swatch group quick without importing it. Better still would be when my PSD opens the swatches would update, although I can see that being a preference which some users might want to disable. Any traction for this one? Feedback is appreciated! 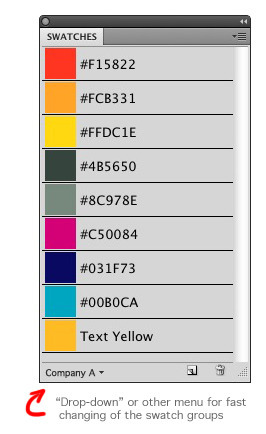 Swatch sets are already files, and there is already a menu for changing them at the top right of the palette. Chris - I see that now... by copying the swatch into the "Color Swatches" directory and restarting Photoshop, you get the file name as an option from the drop down. I was of the opinion that that folder wasn't for specific, project-related swatch files since it initially contains industry recognized color sets. Thanks for showing me this! Same for me Brandon. If we could create folders to organize and switch between swatches set, it would be perfect! Be nice if the program remembered the last few colors used as well per project Setable by user preference. Flash Pro has the ability to save swatches within each FLA file. It's not useful when you have a project with many files but at least, the swatches follow your document, which is good. Illustrator does the same if I'm not mistaking. 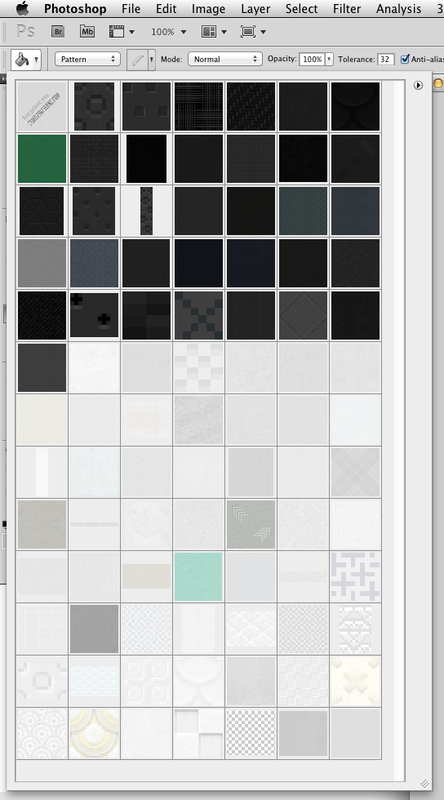 For me, the ability to organize swatches into folders (just like in Illustrator) would be a good start. The best would be some feature that allow us to link swatches with projects or files, like Rachel just said. Photoshop has poor organization. It should have the ability to "page" brushes easily and optionally sort by folder directory. If you have more brushes that go off the page you should be able to page to the off page brushes. The designers must have never used more than a few brushes to have done it the way they did. One should be able to organize any preset by folders/subdirectories and have the represented in photoshop. It is very easy to implement and unimaginable why such a dominant program in the industry is so weak on organization. I'm currently collecting some brushes, trying some, deleting others again and it is a pain to do, if you ask me. It would be awesome to have folders or groups in the brush menue to which you can drag and drop brushes (or out of it). This way I could much more easily reorganize my brushes. Rightclicking on a brush should open a sub menue for deleting, renaming or editing...the usual stuff. Photoshop: Use folders for organizing brush presets. Sub folders in the Brushes and Tools menus would be very easy to implement and make organising brushes much easier. For our digital painting work we use several sets of brush tools- one for high resolution natural media artwork, one for low-res cartoons, etc. Currently these are all kept in one very long list. Constantly Loading and Replacing brushes or tools is far from an ideal solution. Just allow sub folders in the drop-down! Also- the brushes that show up in the Menu Bar Brushes drop down (usually displayed on the left) are not the same as those displayed in the Brush Tip Shape window of the Brushes Panel (usually displayed on the right). They do not sync- if you create a new brush and save it in to a set, or even before this, just when you have created a new brush, it should show up in both lists in the same place. Tom, while I agree with your post, let me specify one thing: tool presets and brush tip shapes presets are not the same. Tool presets are what i Hve been using for the pat couple years now. The enhanced view in the brush presets panel is too bulk and not very useful. I don't need to see how the brush is going to paint a wavy line, I made the brush. I know what it will do when I use it. Being able to have sortable groups that could be collapsed and expanded quickly would be great. OK, if you don't want the preview, change the view of the brushes (thumbnails, large thumbnails, etc.). That is good, didn't know about that since I never use the panel. Tool presets are still more powerful than the brush presets. I might start to use the brush preset panel for quickly browsing stamp brushes though. The large thumbnail view is a nice way to quickly browse. Thanks for the reply PECourtejole, but that point was not regarding the differences between tools and brushes. That point concerned the differences between the Brushes shown in the panel accessed using the menu bar and those shown in the Brushes window when changing the settings for that brush. If you've just made a new brush, it shows up at the end of your list of brushes, as accessed by the Menu Bar drop down. Now, before saving the set (which could do with being a more straight-forward affair) take a look in the brushes shown in the Brushes panel accessed via Window > Brushes. It's not there, certainly not in the same place, if it's there at all. I'm aware of the reasoning behind this but I just don't agree with it. When you've just created a new brush it should show up in both panels immediately. Saving the created brush should be immediate too- so you don't lose what you've done in a crash (or if you just forget to do it as you're busy working on the image!) How about a simple prompt- "Save to Current Brush Set?" on brush creation? The whole process of creating, organising and saving Brushes and Tools needs to be more useful and less complex for the benefit of newbies and old pros alike. It does show up in both, immediately. Are you confusing the brush TIP SHAPE section with the brush PRESETS section? But what you see in the Brushes panel are tip shapes, not the brushes. The brushes are in Brush Presets menu, which is identical to brushes in the menu bar and menu on the right mouse click. There is no "Define Brush Nib Preset" under the Edit menu item. A brush nib is never really a separate entity to a brush, though it may lack any custom settings. You create a brush by going Edit > Define Brush Preset. The care with which we must choose our terms when discussing this issue is indicative of how muddled the process is. I have a Tool that uses a Brush that in turn relies on a Brush Nib (which might even rely on a Pattern for it's texture! )- I think we could keep the flexibility of that hierarchy yet make the creation, saving and organisation of it's components far clearer and simpler. The list of "Nibs" should update when you make a new Brush, and show up at the end of the "Nibs" Brushes collection. Please add folders / organization support for photoshop brushes. I hate how i cant organize my brushes in photoshop ( properly). I would LOVE it if I could create folders for brushes and organize them the way I want. I dont want to have to create brush sets and load and unload them. I want All my brushes available at all times in a Folder hierarchy. Allow the user to name and organize brushes into folders for easy and costumize access. Brush Organization / ADD FOLDERS!!!!. Amen dude. Both Swatches and Brushes. But if we're on CS5 now and Adobe still have yet to permit this simple advance- what hope is there really? for example, it would be nice to group fonts and presets according to style, favorite, recent or whatever in one panel. This would be great w/ fonts. I know you can setup you own presets for brushes, and patterns but this could be much better, especially when you want to append. Currently you don't know where one set starts/ends? Better Font and Preset management. I tried to upload a screen grab of my open Tools panel for you CommonMovement but the Image Uploader here is buggy. The fact that so many people do this just shows how needed better organisation facilities in Adobe CS are. "Are you sure you want to load all 500Mb of Brush Presets in to Photoshop, this may take some time? Ok / Cancel". Too bad this only works with tool presets. So native solution would be better.